Over time, the magazine has fallen victim to a slow economy. Foundation support had made up nearly half of StreetWise's $500,000 budget but is down 60 percent as of 2012. Ad revenues also are in decline and street sales have dropped 20 percent. After publishers and board members announced on April 15, 2009 that declining revenues and foundation support might force a closure with 45 days, donations began pouring in. Before the end of the day, an influx of almost $41,000 helped the ailing publication halfway to its goal. Within a week, over $190,000 in donations were made, far exceeding the needed $75,000 to keep afloat. During a February 2009 meeting, StreetWise's board of directors decided to fire Executive Director Michael Speer and began to discuss potential replacements. Bruce Crane was promoted to turn the company around. Crane reduced operation costs and increased ad sales. The organization went from $200,000 in debt to posting a net income of $1,168 last year under Crane. Jim LoBianco, the former Commissioner for the Office of Homeless Services in Chicago, succeeded Bruce Crane as the magazine’s executive director on January 1, 2011. 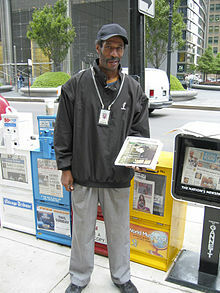 In 2008, the format changed from the original tabloid-style newspaper to a magazine publication. This change was intended to increase readership and advertisement revenue. In 2012, StreetWise began collaborating with The Night Ministry. The objective is to increase the assistance StreetWise provides to Chicago's most vulnerable individuals. StreetWise also launched the Neighbor Carts program. StreetWise vendors will sell fresh produce on Chicago streets as a part of this program. ^ "Who We Are And What We Do". 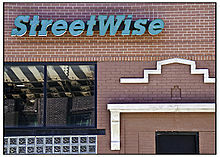 Streetwise.org. Archived from the original on 2009-03-29. Retrieved 2009-04-22. ^ Lydersen, Kari. "A Guide to Alternative Media in Chicago". Chicago Media Watch. Archived from the original on 2008-05-29. Retrieved 2008-04-01. ^ a b c Janega, James (16 April 2009). "StreetWise halfway to goal". Local News. Chicago, IL: Chicago Tribune. Retrieved 22 April 2009. ^ "Donors rescue StreetWise". Chicago, IL: ChicagoBreakingNews co-op. BreakingNews.com. 22 April 2009. Retrieved 22 April 2009. ^ Cabrera, Carlos (March 30, 2011). "Chicago homeless magazine wises up". Chicago Journal. Archived from the original on March 17, 2014. Retrieved 2012-08-20. Green, Norma Fay (1998). "Chicago's StreetWise at the Crossroads: A Case Study of a Newspaper to Empower the Homeless in the 1990s". Print Culture in a Diverse America. eds. James Philip Danky, Wayne A. Wiegand. University of Illinois Press. ISBN 0-252-06699-5.